I’ve teamed up with Nature’s Charm to bring you the perfect ice cream recipe for early fall. Oh yeah, I’m talking vegan salted caramel ice cream, made with just 4 ingredients. Did I mention it’s no-churn? 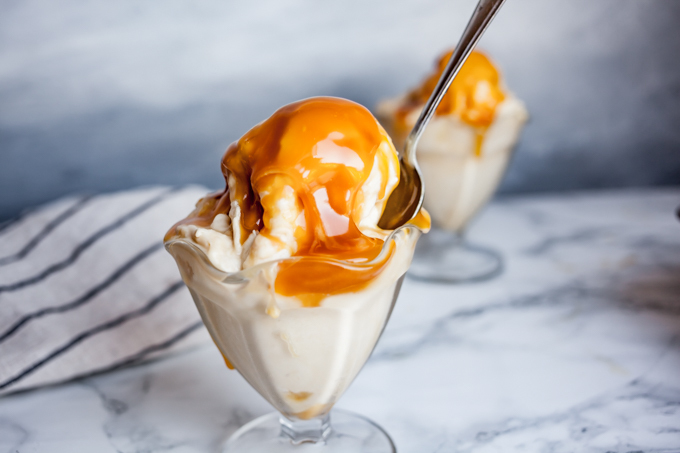 Before Halloween rolls around and “Pumpkin Spice Everything” season officially starts, let’s pretend we’re still enjoying the last moments of summer with this unbelievable vegan salted caramel ice cream! First, let’s talk about the sauce! It is luscious. It’s thick, gooey, and rich, with just a hint of sea salt over the buttery caramel flavors. You can find it in some health food markets or on Amazon here. This sauce is also delicious over bread pudding, as a cake layer, in milk shakes, or even to liven up a bowl of chocolatey oatmeal. There’s no wrong way to do this thing! Be sure to let me know if you try the recipe! Rate it in the comments and tag #carrotsandflowers on Instagram so I can admire you creations! To save this simple vegan ice cream recipe for later, simply Pin the image below. Irresistibly creamy, no-churn vegan salted caramel ice cream. Made with just 4-ingredients! Blend all ingredients in a high-powered blender for 2 minutes until smooth. Pour into a 9 oz loaf pan then cover. Freeze for 6-8 hours until firm. After more than 24 hours in the freezer, this ice cream becomes very firm. If it's difficult to scoop, let it sit at room temperature for 10-15 minutes until it softens a bit. You can also heat the ice cream scooper in hot water before scooping. Soak the cashews for 4 hours or overnight then drain. If you're short on time, boil the cashews for 15 minutes to soften. I like to store soaked cashews in the freezer afterward so I always have them on hand. This post was sponsored by Nature’s Charm, one of my favorite vegan brands I love and have used for years. For more incredible recipes using their fun vegan products, check out my Banana Blossom Vegan Fish N Chips, Vegan Butterscotch Bourbon Bread Pudding, or Vegan No-Churn Pumpkin Ice Cream! Thanks so much for letting me know! They must have sold out quickly after we shared our video. I found another seller with a few packages left of the same sauce. Here’s a link for you, hope this helps!